Beautiful, dark navy compendium made from leather-look material finished with an elegant brushed silver badge. 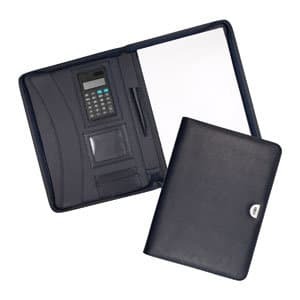 Includes a A4 lined notepad and pen loop and features an outer-zip closure protecting your valuables. Optional black dual powered calculator available upon request (additional costs apply). Supplied in polybag.